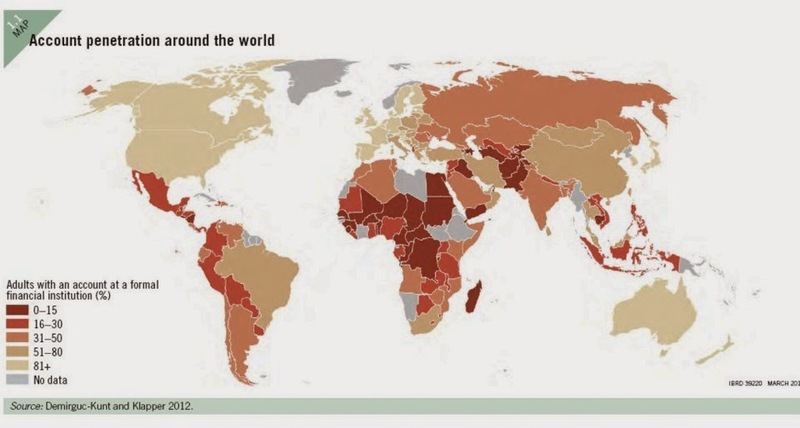 Financial inclusion has become mainstream thinking in economic development. The vast majority of the unbanked live in the developing world, and a significant proportion of this population are rural residents. One can easily surmise, without recourse to statistics, that the bulk of the target audience for institutions seeking to offer them affordable and accessible financial services are part of the rural economy. 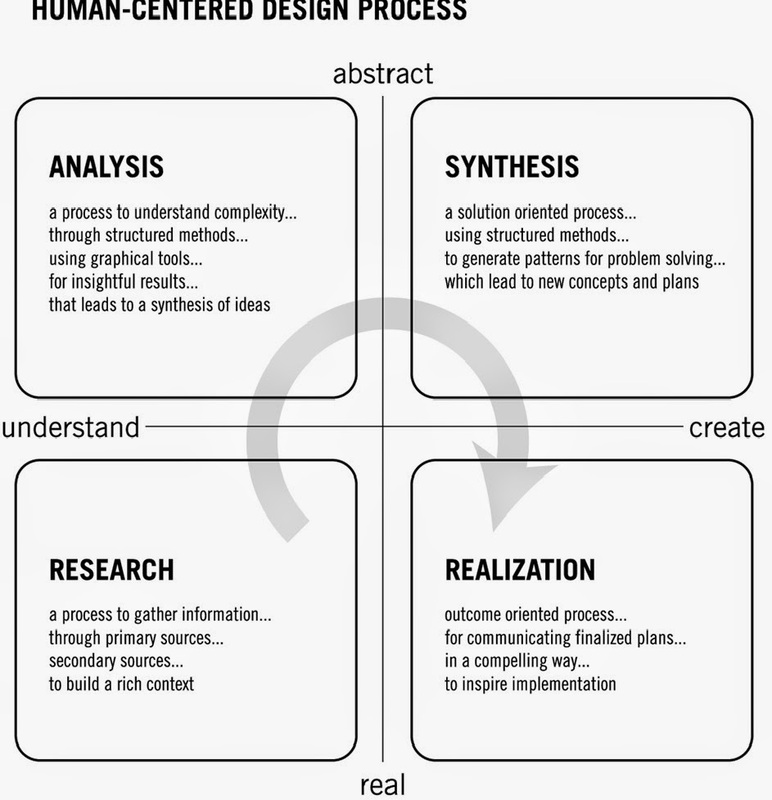 Now, the role of human centered design and its toolbox of methods and processes is being recognized as mission critical for successfully enabling these initiatives. So little is understood about the rural economy, particularly that of the developing world, that without the insights that design ethnography (also known as user research or more broadly, exploratory user research) among the end users can provide, barriers to adoption will remain unaddressed. With this in mind, I thought to share lessons learnt during the past 6 years of experience in the application of human centered design processes in order to observe and understand household financial management behaviour in rural Africa and Asia. Back in late 2008, when I first began framing the original problem statement for the iBoP Asia Project’s first Small Grants Competition, I quickly realized that the methods and tools as developed and disseminated in Chicago, could not be directly applied without adaptation to the distinctly different operating environment, and, the then unusual objectives of business model design. Firstly, the tools and techniques for user research developed and refined in a first world sophisticated consumer market accustomed to decades of market research, telemarketing and surveys of all stripes wouldn’t work among lower income rural residents in a developing world context. They had little or no exposure to market research or design research of any sort, and surveys and questionnaires tended to imply government census takers or some kind of social study by an NGO. After all, it is only now that we are taking the “financially excluded” seriously as potential customers with wants and needs in their own right. What insights can we derive from observing and understanding how those at the BoP currently manage their household budgets to inspire new transaction models or pricing strategies for businesses wishing to serve the poor more effectively, yet profitably? Thus, I found myself not only having to adapt the methods and tools available to me, but also develop frameworks to sample a representative segment of the rural economy given the conditions and criteria of the operating environment. This I will share now for everyone else who will now be using the human centered design approach for financial inclusion. This was the most important element in ensuring the successful outcome. Tina Seelig has written on how REframing a problem can unlock innovation, a valuable insight when you’re already immersed in your own environment like a fish in water. But when we step outside of our accustomed operating environment to one which is dramatically different – a poor rural region for example, we can so often be overwhelmed by the sensory overload that we are unable to contextualize the challenge from the end user’s perspective. We’re too busy noticing all the differences and unable to distinguish the important from the mundane or identify macro patterns of behaviour because we are distracted by the minutiae of daily life. The focus of our exploratory and user research in the field will be to understand the challenge of planning household expenses and budgeting when incomes are mostly irregular and unpredictable. This allowed me look at the larger patterns at play in the rural economy and as I was find out later, provided a foundation for understanding the cash based informal sector prevalent in both urban and rural regions of the developing world. That is, it formed the basis for understanding what makes the informal economy tick, something that I wouldn’t have been able to do if I’d kept the original focus as narrow as why prepaid airtime enabled the rapid adoption of mobile phones among the lower income demographic. The beauty of the human centered design is that nothing is expected to work the first time its built. Prototyping and refining the design based on user feedback and observation is embedded in the iterative nature of the process. This is also part of design thinking – the willingness to experiment to see what works, usually with the participation of the end users. Thus, when I first set out to use design methods in this wholly new way (seeking to understand household financial management among the rural poor), I insisted on a ‘prototype’ location first. This allowed me to test the questionnaire – it was completely thrown out right after the very first attempt to interview someone – as well as develop the framework for sampling uncertainty in the informal sector. Don’t imagine that your carefully prepared questionnaire and the rest of your research protocol will hold up in the field. Be prepared to evolve it in order to see what works. That’s why its so important to frame the problem statement first so that you know what you’re trying to understand. We’re talking about sensitive topics when researching for financial inclusion, and our goal should be tread respectfully towards greater understanding rather than rigidly following research protocol. Design ethnography aims to gather an in-depth understanding of human behavior and the reasons that govern such behavior. The qualitative method investigates the why and how of decision making, not just what, where, when. Hence, smaller but focused and representative samples are more often needed, rather than large random samples. Since the object was to understand how those on irregular incomes planned and managed their household expenses, a variety of claimed income sources such as farming, shopkeeping, job or minicab driving was deemed important to be identified in each location. 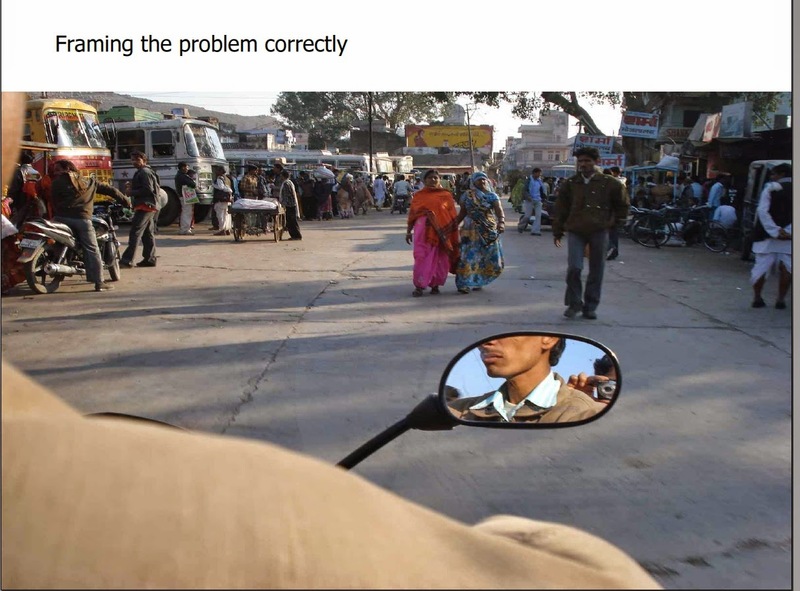 In order to ensure that the sample best represented the local context and situation, a qualifying chart was developed ad hoc in the prototype location (India) as a method to approximately evaluate an individual’s ability to predict the timing and amount of their income, and thus plan their expenses. This found to be useful in ensuring that the widest possible variety of local influences on cash flow were represented in the sample pool, not merely the majority of the population who were farmers, all of whose fields of wheat or rice would tend to ripen for harvest around the same time. For example, in the Philippines, the representative sample pool, by primary stated source of income, included a rice farmer, a minicab owner/operator, a sari sari shop owner, a door to door frozen food seller and a furniture craftsman with his own workshop. It was also ensured that the range of remittances (from zero to only for savings) received by the individuals was also varied. Individuals with full-time jobs were not considered nor were those whose sole source of income was remittence from abroad. This chart formed the basis for sampling across various income streams. The employed have a regular salary, they are able to say with accuracy exactly how much money to expect and on which day. The odd jobs labourer, at the other end of the spectrum, cannot predict if he will get work on any particular day nor how much work. The farmer (generalized here) is able to estimate approximately when the harvest will be ready for sale and its value, though naturally not as accurately as a regular paycheck. 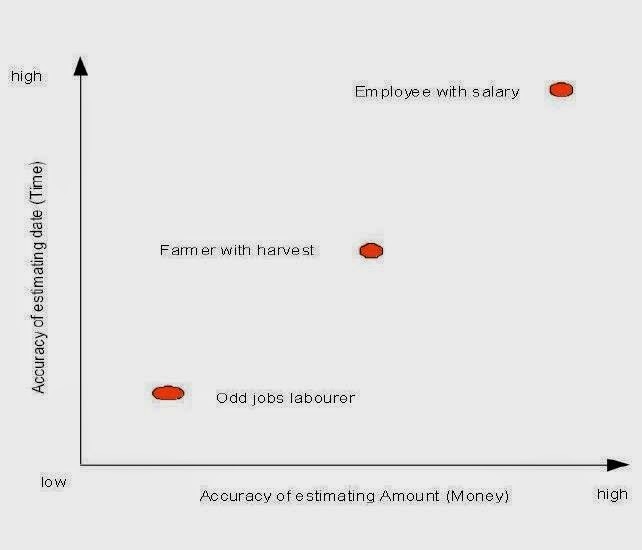 If you are only looking at farmers’ incomes then consider a spread across cash crops, size of harvest, crop mix and produce sales patterns. There are high potential farms and low potential ones. The idea is not to end up with your entire pool of people with similar patterns of cash flow. If you’re looking at a village or rural population cluster, consider agribusiness services such as shopkeepers and transporters, as well as other service providers such as water delivery, small kiosk, market traders etc. The reason for this is due to the variance in people’s ability to plan for savings, loans, mortgages, credit or other financial products based on their ability to predict their cash flow. The more uncertain your income stream, the more risk averse you’re likely to be. Choosing locations to sample depends on the aim of the design research study – are you looking at the entire country? Or just one particular region? Based on geography, different parts of the country may have more or less food security, so again it makes sense to sample from at least two if not three distinctly different areas based on their economic standing. From the perspective of financial inclusion, it doesn’t make sense to only look at two similar economic regions with cash crops, unless your study’s focus is a middle or higher income level demographic.You may also wish to consider a spread of profiles based on their distance to the nearest market town or financial services institution. Patterns of behaviour will differ based on time and money it takes to travel. For instance, even if your income streams gave you the confidence to consider a loan, the cost of travel may not make it worth the effort. The informal and rural economies are far more sophisticated in their financial management than we are able to perceive in the first instance. Designing solutions that work with the rhythms of the natural seasonality are more likely to be adopted than those which impose calender schedules. Negotiable flexibility and trust based webs of cooperation are part and parcel of the hyper local rural economies. How can we retain these pillars of community life and resilience in the face of adversity and uncertainty even as we seek to include the marginalized with our modern tools and technologies?